Front spring shackle set for the 1935-40 American Ford V8. Metal Bushing Type, Car & Pickup. Pin centres 1 1/2" Set of 2 shackles. 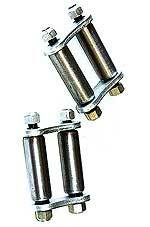 1935-40 Front Spring Shackle Set, Also fits 1935-40 Pickup and 1938-39 122 inch wheelbase 3/4 Ton truck. Pin centres 1 1/2" Set of 2 shackles. 1948-52 Front spring shackle set for the English Ford V8 Pilot. Front Shackle Set, Metal Bushing Type, For the 1941 Ford V8 cars. Set of 2 shackles. Pin centres 2 1/4"
Front Shackle Set, Metal Bushing Type, For the 1942-48 Ford V8 cars. Pin centres 2- 5/8" Set of 2 shackles.